Browse Artists and Groups Franklin Arbuckle, R.C.A. Born in Toronto in 1909, "Archie" Arbuckle was an admired teacher at the Ontario College of Art (O.C.A.) where he had a profound influence on the many artists who had the good fortune of being his student. His wife was fellow artist, Frances Ann Johnston and his father-in-law, Frank Johnston, was a founding member of the Group of Seven. In his youth, Arbuckle himself was a student at the O.C.A., having enrolled in 1927 at the age of 22. He studied under J.E.H. MacDonald, Fred S. Haines, J.W. Beatty, Arthur Lismer and Frank H. Johnston and received scholarships and honours in both years of his studies. In 1930, he left to establish his own studio. Arbuckle was elected to the Ontario Society of Artists (O.S.A.) in 1933 and to the Association of the Royal Canadian Academy of Arts (R.C.A.) in 1936, finally becoming a full member in 1943. He spent most of his life in his native Toronto, with an interlude in Montreal from 1940 to 1958. Often commissioned to complete works across Canada and abroad, he travelled extensively for work and pleasure courtesy of CP Rail and CP Air. His destinations included Newfoundland and the east coast, the prairies, the Arctic and Western Canada. It was in 1958 that Arbuckle and Frances-Anne Johnston returned to Toronto and Arbuckle began his career teaching at the O.C.A.. There, over his career he occupied various positions, as a faculty member and then as Chairman of the Fine Arts Department. From 1960 to 1964, he acted as R.C.A. president and visited Europe for the first time. During the remainder of his career he would re-visit Europe almost annually and, on behalf of the O.C.A., established an off-campus college facility in Florence, Italy. Arbuckle also revisited the east coast of Canada including Newfoundland and Canada's western provinces. In 1989, after 40 years, he retired from teaching at the O.C.A.. Arbuckle passed away in Toronto in 2001. In his lifetime, Arbuckle was twice awarded the Jessie Dow prize (best picture in show) by the Montreal Museum of Fine Arts, received four major Art Directors Club Awards, the International Business Machines Medal and the Centennial Medal. His paintings have been shown in major galleries and museums in Canada in solo and in group exhibitions, such as the Montreal Museum of Fine Arts, Musée National des Beaux-Arts de Québec, Art Gallery of Ontario, London Art Gallery, Roberts Gallery in Toronto and at Galerie Walter Klinkhoff in Montreal. Arbuckle also exhibited at the World's Fair in New York. His work is included in many private and public collections in Canada, United States, London and Paris. Galerie Walter Klinkhoff has held several solo exhibitions for Franklin Arbuckle. It is noteworthy that in our experience, these exhibitions were attended by more artists than any others we hosted, occurrences that serve as a particularly moving example of the high esteem in which "Archie" was held by his peers. Arbuckle was a painter of tremendous merit who composed in a distinct and original style. 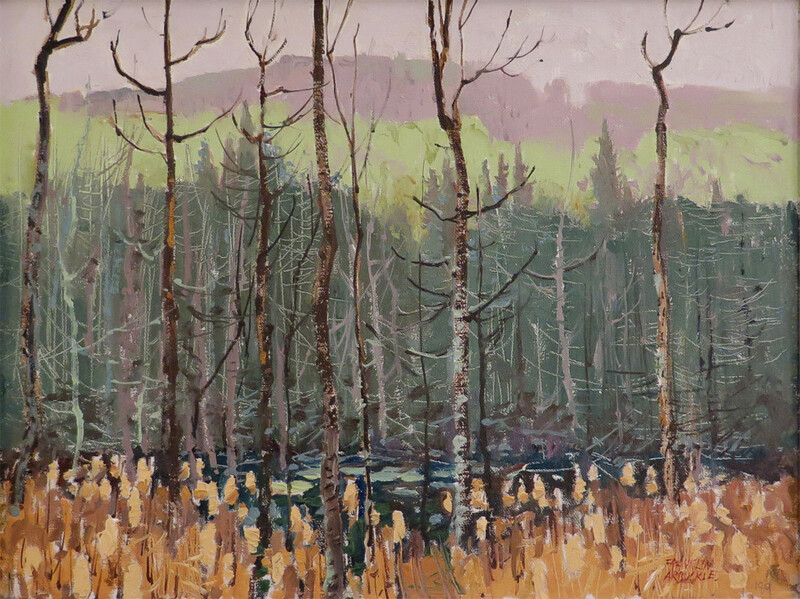 His paintings are strong and original representations of the Canadian landscape and cityscape. He had a keen sense of composition and his ability to capture the mood and the impact of a specific time and place is highly regarded. Arbuckle completed historical illustrations for the Hudson's Bay Company and did the cover illustrations for approximately 100 editions of MacLean's magazine. 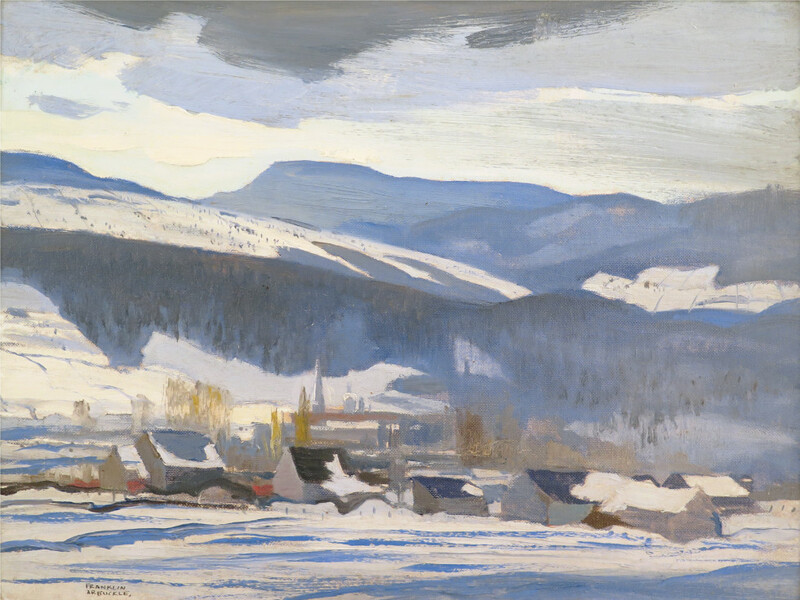 Today his works are of interest to collectors in search of outstanding Canadian art and exceptional value. Please send me more details about the following artist. Franklin Arbuckle, R.C.A. 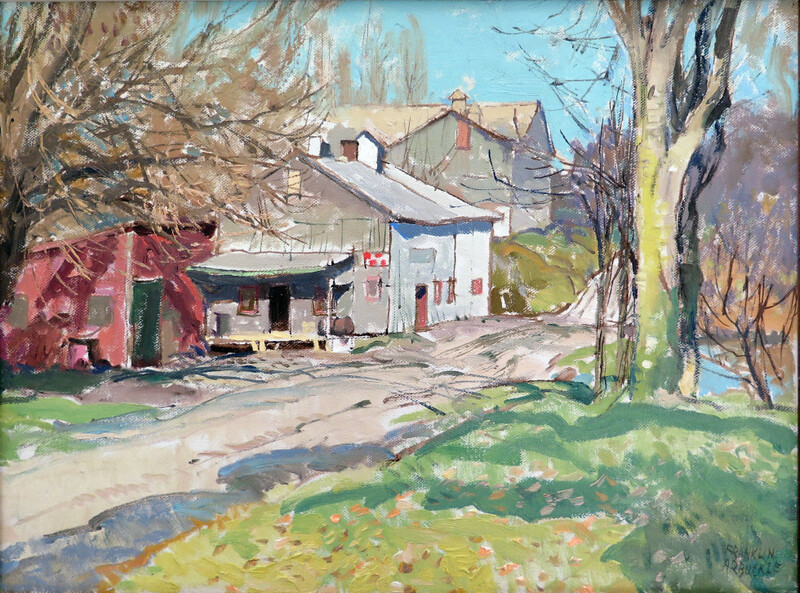 titled, dated, and signed, "DE SALVOS MILL / NOV 15 '85 / FRANKLIN ARBUCKLE" (verso, centre). titled, dated, and signed in black ink, " BULRUSHES / CARNARVON / MARCH 28 / /80 / FRANKLIN / ARBUCKLE" (recto, centre). inscribed in ink in an unknown hand, " #27856" (recto, upper left).